This product requires a hardener, please see related products. This is a 2K High Solid acrylic clearcoat that provides superior gloss and a perfect final finish from the easy after-flow. This Max Meyer lacquer is suitable for any industrial, motorcycle or car refinish application. Maxiclear HS is a 2K high solid clearcoat which has excellent flow, is quick drying and quick to polish, giving good hardness and gloss. It can used for spot, panel and overall repairs. 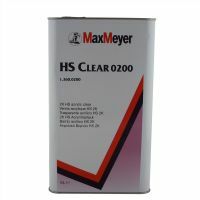 When used with MAXICAR® HS, it is the best choice for your high solids clearcoat.